Buoyed with our success with the Little Bustard we headed back south towards the coast for the afternoon and the skies were now blue as far as the horizon. The sun wasn't too unpleasant however since there was a pleasant breeze and we headed straight for the coastal village of Bolonia where we had good gen on an interesting species. Parking up on the road we wandered up the sandy beach where a group of 4 Kentish Plovers showed really well just in front of us. It makes you wonder why, in many parts of the world, birds will live and breed close to humans even when they get disturbed all the time by people walking past, whereas in the UK everything is very sensitive and gets disturbed so easily. We passed some ancient Roman ruins where we flushed a small warbler from the weeds to our right. It flew across and perched up on a stone wall to reveal itself to be a cracker of a male Spectacled Warbler. Its the kind of species that you read up on, because you think ID might be tricky, but when you see it in real life it's bloney obvious. And also a species I had forgotten about occurring here and so was a total surprise! Only my second sighting of this species after a single bird in the Israeli desert 25 years ago. It was showing really well but moving very quickly and I may have got better photos but there was a fence between us and the bird. However, despite its quality, the Spectacled Warbler was not our quarry here on Bolonia beach. We had been given very specific directions where to go by Niki and Simon in the pub the other night that they use when doing their tours (so specific I don't want to give them away on here!). We followed these instructions and started inspecting the trees but there seemed to be a heck of a lot of bush to wander round. 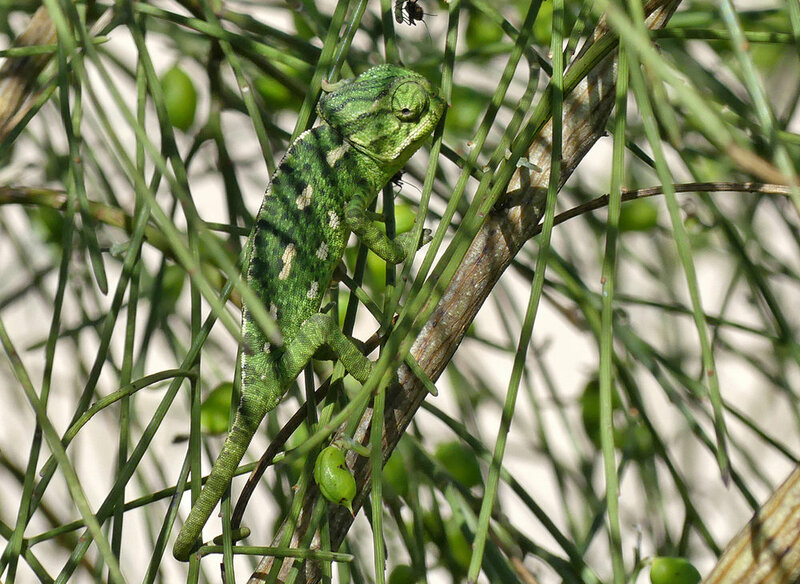 However, just when I was thinking it might be a needle in a haystack-type situation, I moved aside a branch, peered into the bush and came face to face with the scaly chops of a Mediterranean Chameleon! It was such a treat to see this unusual reptile slowly creep through the foliage and you could see how tricky it was to spot, being the same colour as the twigs (unsurprisingly) with the dark stripes and pale splodges to break up the body shape, mimicking patches of shadow and sunlight. They are not hugely rare in these parts but very difficult to find and we were grateful that Niki and Simon had given us such accurate instructions. We left the beach with the intention of exploring a wooded hillside above the village, hoping to maybe locate an Iberian Green Woodpecker judging from the number of recent 'dots' on the eBird maps. However, climbing the windy road up the hill we came to a military sign which told us not to progress. There was nothing in our research that said you can't drive up that road but its not a good idea to contradict such severe signage when travelling abroad, so we turned around. 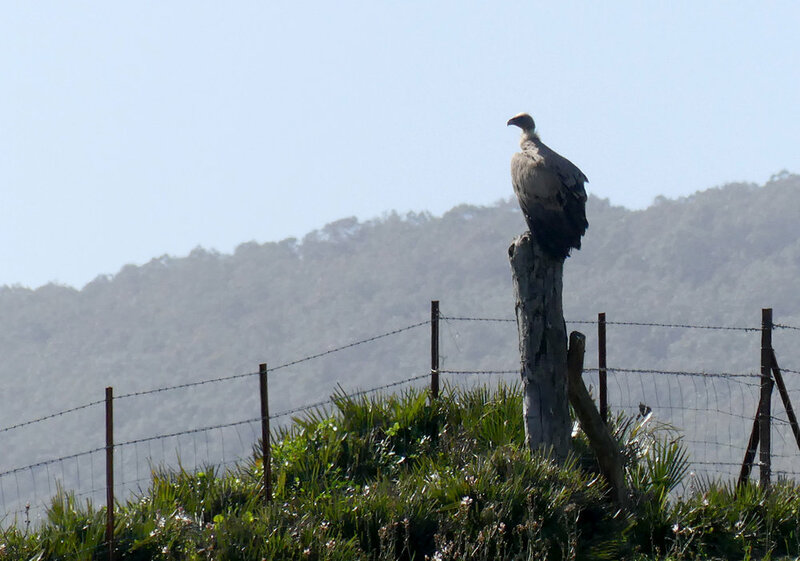 We then headed back up the road away from the coast and as we ascended we noticed a group of Griffon Vultures down on the deck. We stopped the car and took a close look at them and they didn't seem too bothered about us being there, or the two or three other cars which had stopped to see what we were looking at. There was probably a carcase just out of view that they were finishing off. However, I did not spend a lot of time watching the vultures as I was more interested in a lark perched up on an old wall. The habitat here was hilly and rocky and my initial impression was that the bird was a THEKLA LARK. This is a very similar species to Crested Lark, if unfamiliar with both species, but we grilled it the best we could and decided that it was a Thekla - a new species for me. It appeared to have a shorter bill than the Cresteds we'd seen and was a lot greyer and paler, with darker breast streaks in a clear pectoral band. When it faced away we could see contrasting rufous tones to the tail and uppertail coverts and it had a very clear supercilium and less obvious crest. All the Crested Larks we had seen so far were in the lowland fields and coastal dunes, so the habitat was just right for Thekla. We drove back down towards Tarifa to drive up the last hill before the town, known as La Pena. The main reason for doing this was to search for Black-eared Wheatear as this was apparently a good area for them - however, we did not find any. Initially, we clearly drove way too far up the road but this gave us great views southwards towards the straits. These hillside meadows had plenty of flowers, and plenty of insects were out in the now pretty warm weather. We saw a few Red Admirals, a Hummingbird Hawk-moth and a flashy Monarch flapped past us. Researching this after we came home, I found that this little valley is actually the epicentre of the area that Monarchs have colonised in mainland Europe. There were not many uncommon birds around here, although we did think that the larks here were also probably Thekla Larks. It was now late in the afternoon and we decided that we should give La Janda one final try. This would be our 4th visit here in 24hours but we were determined to see a Black-shouldered Kite (spoiler alert : we didn't - all trip). The splendid evening weather had brought the hunting raptors out and we thought we stood a great chance of finding one. We had three species of harrier hunting the same field at one point - with ringtail Hen Harrier briefly joining the female Montagu's and two Marsh Harriers that were already there. We also saw two male Montagu's Harriers and both times, with the grey and black plumage we called out "kite!" before we realised. A new species for the trip list was a female Merlin which chased the small birds round the fields. Other than that, it was mostly the same species we'd seen earlier in the day. The large wading birds regularly flew past us into roost and we left as the light started to dim. We visited the supermarket and I cooked up my own version of a Spanish Omelette (vegetable omelette with oven chips) and over a couple of beers, we reflected on a busy and successful day out in the field - apart from those damn kites!